The Capricorn Coast is a coastal region in Central Queensland, Australia, generally spanning the areas between Keppel Sands to the south, and Byfield and Shoalwater Bay to the north. Astride the tropic of Capricorn and 40 kms east of Rockhampton, the administative centre of Central Queensland, the Capricorn Coast is a rapidly growing area of Queensland, and includes the towns Yeppoon and Emu Park. Founded in 1853, the majesty of Rockhampton’s historical architecture has captured the hearts of visitor for decades. Many fine public and private buildings, including the Customs House, old Post Office, Cathedrals, banks, business houses and homes, are constant reminders of the city with an exciting background. The Southern Great Barrier Reef region is the coastal fringe of Keppel Bay and because of its beaches and the islands within proximity it has become the seaside holiday place for Rockhampton and Central Queensland. 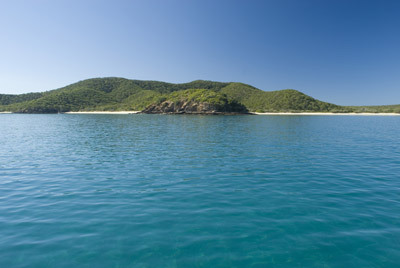 Great Keppel island (pictured left) is the largest of the eighteen islands in the Keppel Group, and covers an area of more than 14.5 square kilometres. Much of the island is national park, the island being part of the Keppel Bay Islands National Park. The tropical climate and its 17 pristine white sandy beaches, coves and pockets of fringing reef attract tourists from all over. About 100 kilometres south of Rockhampton is Gladstone, one of the most substantial and successful ports in Australia. The success of Gladstone can be attributed mainly to its major industries of Coal and Aluminum. Of course, it’s not all work at Gladstone, there is plenty to see and do in the area surrounding the city, such as Port Curtis Historic Village, Quoin Island, Curtis Island and Castle Tower National Park. Bundaberg is located on the Burnett River about 20kms inland from the Southern Great Barrier Reef coast and is a thriving city dominated by the sugarcane industry which surrounds it, but also supported by the growth of beef and dairy cattle and tropical fruit. The area provides nearly 20 per cent of Australia’s sugar and is the country’s largest producer of brown rum (known as Bundy Rum). Further down the Southern Great Barrier Reef coast is Hervey Bay, with a string of interconnected villages – Urangan, Torquay, Scarness, Pialba and Point Vernona. Hervey Bay is a well-frequented holiday destination, a huge retirement centre, and the most popular access point to Fraser Island. Modern tourism started in the 1950s when Hervey Bay became a popular retreat for people attracted to the area by the warmth of the climate. It has continued to grow in popularity so that in 1984 Hervey Bay was proclaimed a city. Read about the history of the Great Barrier Reef. It is impossible not to be impressed by Queensland's inspiring coastal cities. Bundaberg, Rockhampton, Mackay and Townsville all have a charming late-nineteenth century elegance about them. There are many activities available to visitors to the Great Barrier Reef.